UPDATE: 2019 Media, Photo & Film accreditation applications are now closed. There aren’t many rules in Tankwa Town (and everyone’s agreed it should stay that way) but when it comes to photography and film, etiquette is all about common sense and respect: ask first. This golden rule about consent is a very big deal in a space where people are expressing themselves in ways that they wouldn’t necessarily want shown in public or published – and it applies to everyone at the event who’s interested in shooting film, taking photos or reporting on the event. So, whether you’re a happy snapper with a point ‘n shoot, a professional photographer or taking shots for a media title, you need to be respectful of people’s right to privacy. Even if they’re naked as the day they were born, the onus is on you as the photographer to request permission if the image you intend to record would in any way infringe on another person’s rights. One important thing to bear in mind about AfrikaBurn is that it’s not a public event – it’s held on private land, with access limited to those who have tickets. This means that unless you have express written permission to publish people on photos or film, you can’t. Why? Because it’s against the spirit of what we do to publish your fellow participants in any media without their knowledge – and this is especially relevant when the person you plan on photographing is naked or semi-naked. In the same sense that you wouldn’t want your photo taken and published without your knowledge, so taking photos of other people – no matter whether naked, fully clothed or asleep – without their permission is unacceptable. This includes images that could make their way onto social media sites, or be featured in the mainstream press. Obviously if you’re taking shots of inanimate objects, art or landscapes then these considerations change – but in those instances, if you’re shooting an artwork or other creation, it’s good practice to attribute those where possible. If you don’t know the name of an artwork or mutant vehicle, or theme camp, check our WTF Guide for the detail – or just ask someone. The team at our Arteria (located right next door to our Media Centre at Off-Centre Camp) are at your disposal: you can always ask them for the ID on artworks and artists – and they have event guides available for you to use for the same purpose. Though there are lots of festivities at AfrikaBurn, in essence it’s an arts event that attracts people from all walks of life who are involved in myriad projects that come to life in the desert. It’s not a music festival. So, in your pursuit of your story, consider your focus. Are you planning to hone in on artworks, personal stories and the creative process? That’s the kind of storyline and content that does justice to the hard work and creativity that’s on show in Tankwa Town. If you’re applying for accreditation, know this: proposals that keep the essence of the event in focus are favoured above any other, as the art, mutant vehicles, costume and décor created and gifted by the thousands of participants is where the real story lies. If you’re only looking to capture the dancefloors at our event, perhaps consider other events – because (much as we love and respect the crews that pour their hearts into incredible immersive sound spaces) there’s a lot more to AfrikaBurn than sound systems and dancefloors. COMMERCIALS / MUSIC VIDEOS / PROMOTIONAL FOOTAGE? If you’re aiming to shoot a music video, promotional clip or get footage at AfrikaBurn that’s aimed at marketing a product, please be aware that accreditation is not provided for projects of that nature. Why? Because – in line with our principle of decommodification – our community doesn’t seek to profit off each other or use our culture as a backdrop for commercial enterprise. This includes using AfrikaBurn, or the artworks and people who make the event what it is, as props. So here’s the deal: as mentioned, personal use of photos, whether kept for private use or shared on social media, is fine – though the usual rules of play of consent and consideration still apply. However, with the rise of Instagram and Facebook, new aspects to the use of photos taken at AfrikaBurn are worth considering. For example: can you take photos of people at AfrikaBurn, and use them to promote products such as clothing, costume wear or accessories, by @ and # tagging them on social media platforms? Just like a camping gear or clothing brand, or commercial film shoot of any kind, would never be permitted to come to the event and make use of the art, people and creative contributions as a backdrop or set for their shoot, so the same applies to influencer shoots – or shots shared after the event that seek to draw attention to the products featured in the image or video footage. There may be many other events where this form of promotional use of images is absolutely fine – but AfrikaBurn is not other events: it’s an explicitly decommodified space. In other words, nothing in Tankwa Town is available to be used as a photogenic background for any commercial entity, brand, service or product. If & when this does happen, our Comms team will step in and request that the content is removed – and anyone leveraging our event or community by using them as a backdrop for a brand photoshoot (on Instagram or anywhere else) can be refused entry at future events. Civil aviation regulations that apply to drones & UAV’s have rapidly changed over the last 3 years, with the result that any drone-mounted camera footage is now strictly controlled, especially over areas such as active airspace and over people and populated areas (both of which our city features). Only drone pilots that are fully certified and permitted in line with CAA regulations are able to apply to shoot airborne footage in or near Tankwa Town. Recreational drones are not permitted, under any circumstances. If you have any plans to capture stills or film from a drone, you would need to follow the same registration process as all other registered operators of flying and aerial craft. For more info, please see our Aircraft / Drones page. To obtain accreditation, you’d need to submit a detailed proposal of what you plan to cover, film or shoot at our event, as part of your application. For more info on Media & Photography guidelines, read our download the Rules & Etiquette doc. Accreditation applications for our 2019 event CLOSE MARCH 22nd 2019. 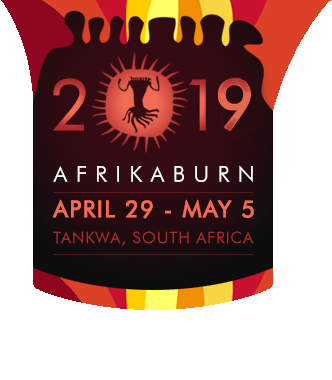 PLEASE NOTE: Accreditation for AfrikaBurn does not entitle the recipient to any benefits (including tickets), and the right to refuse accreditation applications is reserved.